Since 2002, STP has sponsored a series of yearly "Best Practices" in teaching and pedagogy conferences in Atlanta, GA. These conferences also have benefitted from the sponsorship of Kennesaw State University and the National Institute on the Teaching of Psychology (NIToP), among other sponsors. A series of edited "Best Practices" books has developed from these annual conferences. The teaching topics contained in these books include educational assessment, introductory psychology, research methods and statistics, culture and diversity, critical thinking, and beginning (e.g., introductory, orientation to the major) and ending (e.g., capstone, research intensive, seminar) courses, and teaching with technology. Although the work of many conference speakers is represented in these books, there are not traditional "proceedings" volumes; rather, the content is fresh, up-to-date, and focused on providing teachers in secondary and post-secondary settings with practical tools and techniques for teaching about psychology and improving student learning. (The contents of each volume are listed at the respective publishers' web sites--just click a book's cover or its title.) All the royalties from these books go to STP to fund future endeavors aimed at promoting teaching and learning in psychology. Dunn, D. S., Mehrotra, C., & Halonen, J. S. (Eds.) (2004). Measuring Up: Educational Assessment Challenges and Practices for Psychology. Washington, DC: American Psychological Association. Dunn, D. S., & Chew, S. L. (Eds.) (2006). 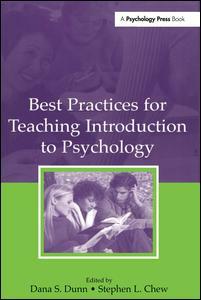 Best Practices for Teaching Introduction to Psychology. Mahwah, NJ: Erlbaum. Dunn, D. S., Smith, R. A., & Beins, B. C. (Eds.) (2007). 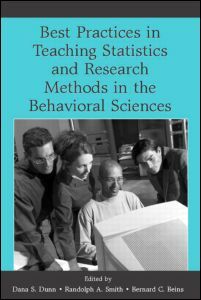 Best Practices for Teaching Statistics and Research Methods for the Behavioral Sciences. Mahwah, NJ: Erlbaum. Dunn, D. S., Halonen, J. S., & Smith, R. A. (Eds.) (2008). Teaching Critical Thinking in Psychology: A Handbook of Best Practices. Malden, MA: Wiley-Blackwell. Gurung, R. A. R., & Prieto, L. R. (Eds.). (2009). Getting Culture: Incorporating Diversity Across the Curriculum. Sterling, VA: Stylus. Dunn, D. S., Beins, B. C., McCarthy, M. A., & Hill, G. W., IV. (Eds.). (2010). Best Practices for Beginnings and Endings in the Psychology Major. New York: Oxford University Press. Dunn, D. S., Wilson, J. H., Freeman, J., & Stowell, J. R. (Eds.). (2011). Best Practices for Technology-Enhanced Teaching and Learning Connecting to Psychology and the Social Sciences. New York: Oxford University Press. Dunn. D. S., Gurung, R. A. R., Naufel, K. Z., & Wilson, J. H. (2012). Controversy in the psychology classroom: Using hot topics to foster critical thinking. Washington, DC: American Psychological Association.